2017 is the year in which RosBREED is shifting attention to each of you specifically, rather than all of you in general. You, of course, are creative and industry-sustaining U.S.-based breeders of rosaceous crops. Rather than relying on workshops at conferences, which some of you attend, and articles such as this one, which some of you read, we are talking to and hearing from each of you. On-site visits are increasing in frequency, as are phone calls, emails, and other follow-ups. A webinar series and online training modules, both interactive, will be launched soon. It takes a village – or at least a team – to effectively engage with the 80-odd breeding programs across the country (read about our Team in the March 2016 RosBREED Newsletter). A systematic approach was recently developed to equip multiple team members, as well as interested breeding personnel and future professionals, with the skills to understand a program’s situation and needs. During an Australian sabbatical during the previous U.S. winter, I developed an “assessment instrument” for identifying the capacity, needs, preferences, challenges, and opportunities of any given breeding program via a series of in-depth questions. According to answers from the breeder and staff, compelling next steps become apparent in which DNA information might be helpfully integrated. I began its use with some Australian fruit breeding programs, and it formed the basis of this past summer’s visits to Californian stone fruit and berry fruit breeding programs. As a team, we are now better able to help in tailoring DNA-informed solutions to the idiosyncrasies of your program. One size does not fit all! However, a recurring opportunity to be had is parentage verification. Breeding needs are directly targeted by crosses if parentage is correct. In contrast, breeding hunches and statistics fall apart if parentage is wrong. Perhaps the next most beneficial application of DNA information is identity confirmation prior to trial planting or in mass propagation, to provide peace of mind and avoid uncommon disasters. What is a key challenge currently faced by your breeding program and how are you trying to tackle it? 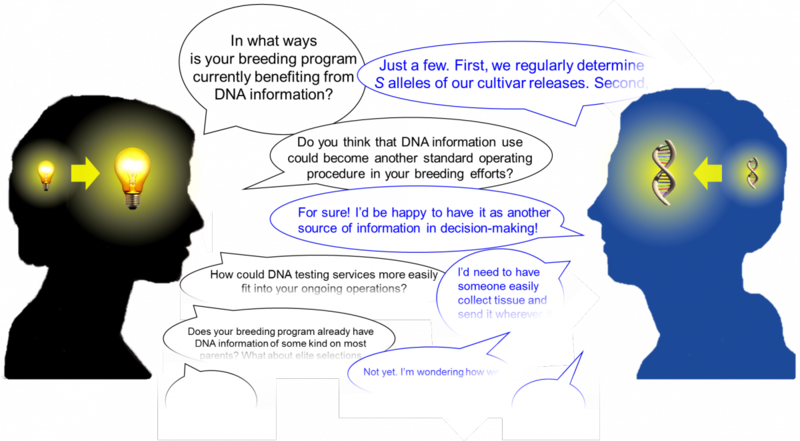 In what ways is your breeding program currently benefiting from DNA information? Are those benefits routine? • What is your current understanding of the pros and the cons of DNA-informed breeding for your program? Three to 10 years from now, what breakthroughs do you envision for your breeding program? What will it take to achieve them? Expect to be contacted soon if you haven’t already heard from us, and get ready to engage! If you’d like to discuss opportunities for your program sooner rather than later over the phone, or are looking forward to an in-person visit, or have a webinar or online training module topic to suggest, please contact me and/or Julia Piaskowski. Breed on!